Why are you going to have problems with those transactions? Because fund transfer to unregistered account requires One Time Password (OTP). This OTP will be sent to your mobile number (mobile phone). The same with enrolling 3rd party account which also requires OTP. If you're using a new mobile number, you cannot receive the OTP which is needed to be entered into those transactions. If your old mobile number (the one you indicated upon online banking enrollment) is lost because you lost your sim or phone, you need to update or change your mobile number. 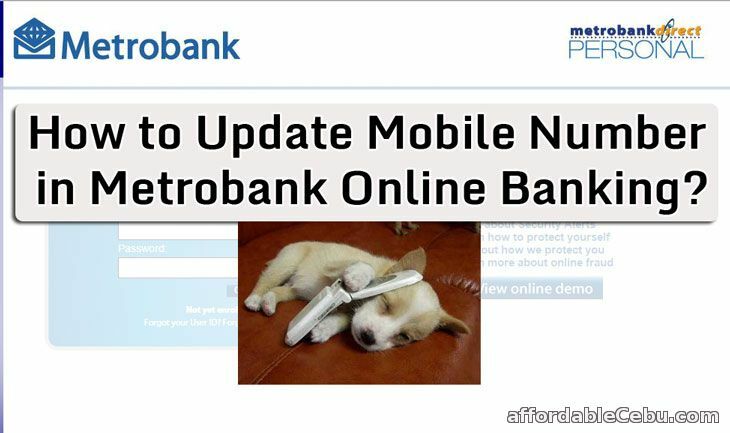 How to update or change your mobile number in your Metrobank Online Banking account? Option 2. Go to your Metrobank branch of account and request for mobile number update for online banking. If you don't want to go to the Metrobank branch, you can call them through phone. They can update your mobile number by phone but they will verify your identity first by checking your personal info or your ID numbers of your valid ID's. Option 3. Call Metrobank Customer Service Hotline. Option 4. The easiest one is to create a new Metrobank online banking account. Here's how: "How to Enroll in Metrobank Online Banking?". Make sure to enter your new mobile number upon registration. This will take 5 minutes to register online. Are you having problems with updating your mobile number? "How to Update or Change Mobile Number in Metrobank Online Banking (MetrobankDirect)?" was written by admin under the Banking category. It has been read 52720 times and generated 21 comments. The article was created on 09 July 2015 and updated on 09 July 2015. Hi, paano po gagawa ng bagong acct. Eh nakaregester na ang acct. No.. sinubukan ko sya pero nag eeror msg. Naman. i want to update my mobile number in my metrobank online account, i can't do any online transaction without receiving OTP password. I already called before ako pumunta sa ibang bansa para mag changed ng mobile number coz i know need ng otp when I do transactions online pero bakit ganon? Napalitan nga mobile number ko pero bakit yung otp is dun pa din sa lumang mobile number ko pa din nag sesend? Only option 2 is now allowed. Napaka hassle po talaga lalo na sa atin na nasa ibang bansa. Simpleng change of phone number lang ke haba ng proseso. Napaka inconvenient po talaga. Kaya ka nga nag mobile banking para ikaw na ang mag uupdate ng sarili mong details. Phone number lang pinapa change ang hirap pa gawin. Tapos pano pag wala ka nang Philippine mobile number. Ang hirap ipa activate ang overseas phone number mo plus sabi pa ng customer service hindi nila maga guarantee na mag wowork ang overseas number kahit ilagay sa account file mo. BDO and Citibank po I dont have any problems sa pag generate ng OTP pin kahit overseas number pa. So disappointing. Honestly I don’t know why your company has this mobile apps which doesn’t useful at all. It only gives your client a hard time to check our saving account specially if we were outside the country. Pls fixed it and make it quite easy to access. Thank you. Hi, I have downloaded the METROBANK APP on my phone and enrolled with my old email + other mobile number. However I couldnt enter my old email anymore and wanted to put in a new email add. When i tried to do so, they wont accept anymore because ,my mobile number is already registered. How can i remove the registered mobile number so i can use it again. metrobank?? why you dont have any options for changing mobile number???? it consumes a lot of time waiting on your return email. Paano ba marerecover ung account ko para magcheck ng balance? Wala na akong access sa mobile number ko kasi andito na ako sa Riyadh. Hindi ko marereceive ang OTP.Gusto ko echeck ang balance ko. Please help me. Thank you. metrobank!! !wala b kmi ibng option! anu bibigay ko number s inyo?eh ang number ko n bngay ko nung nsa pinas ako wala na un! ang hassle na ng pnpgwa nyo samin gusto ko malaman ang balance ko! tumwag ako s hotline nyo naubos lng ang lod ko ang tagal nyo sumagot! ang pangit ng serbisyo nyo! Putangina naman metrobank !! International bank kayo at ang major customers niyo is OFW para makapag-transact kami online. Sana alisin niyo yan OTP kasi walang kwenta yan sa amin mga OFW's kasi ang sim card natin sa pinas hindi gumagana sa lahat ng bansa mga putangina niyo kung sino man nagisip ng OTP na yan. Bakit hndi niyo gayahin ang RCBC instead na OTP may option sila na security questions ! Mga putangina niyo lalo na IT department niyo mga utak talanga. Tapos napaka-bagal sumagot ng mga customer service niyo sa telepono!! Ubos na load namin tangina "please wait" parin yun sinasabi. PUtangina niyo sana mag-invest naman kayo sa customer service niyo at online banking niyo. Tangina niyo kaya kayo nauunahan ng BDO at ibang mga bangko kasi mga puta na nga serbisyo niyo ambagal niyo pa !!!!!!!!!!!!!!!!!!! Nakaka'hassle naman pupunta pa sa designated branch na from where i applied my ATM just to change my number pano kung nasa Ajman ako tapos Abu Dhabi ako naka pag register. Sana lagyan naman ng option to change through online. And it's too costly na tatawag pa sa customer service then time wasting also. Sana yung hindi naman nakaka hassle. still now I couldn't receive. i am here abroad, i have my metrobank credit card but forgot to activate it prior my departure and my previous phone registered is not valiied right here right now. Please help. Thank you very much. All other options except option 2 is possible. They won't allow changes unless you go to the branch where you signed up personally. Option 4 is not possible. The system detects that you have an existing account already. When I called they said that they no longer accept mobile changes and that I have to go to my branch to update my mobile number. How to Enroll in Metrobank Mobile Banking? How to Unlock Your Locked Metrobank Online Banking Account?